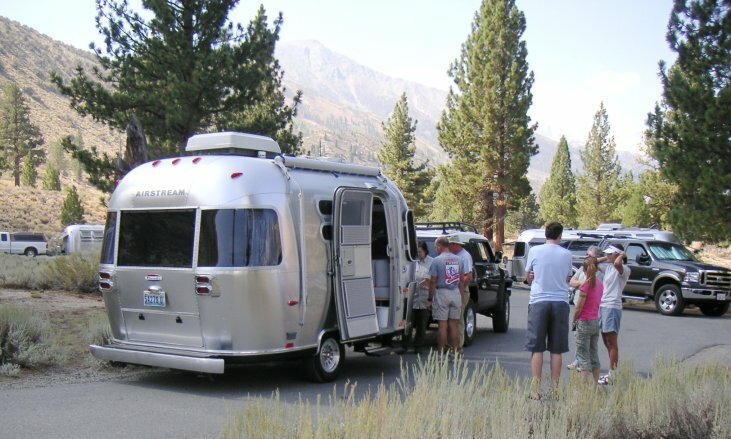 The SNU Rally at the Lahontan State Recreation Area turned out to be an opportunity to really appreciate what the Airstream RV could offer. This weekend turned out to be when the first fall storm went through Northern Nevada. Lahontan was a great place to experience the clouds, the colorful sunsets, the wind, the rain, and the breaks in the weather with crystal clear views. 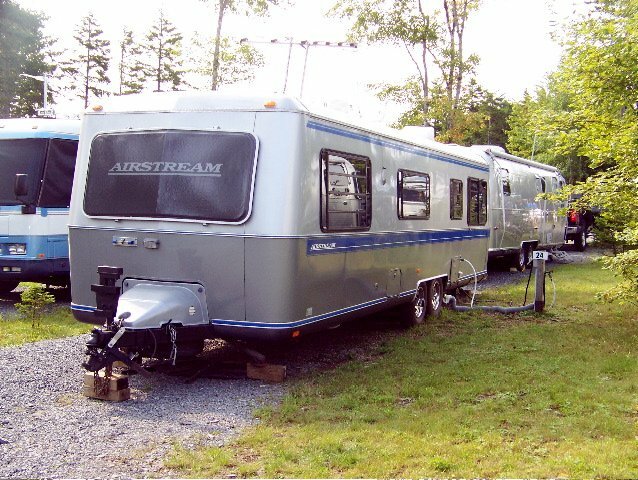 Here’s a late 80’s mid length Airstream. A true classic. 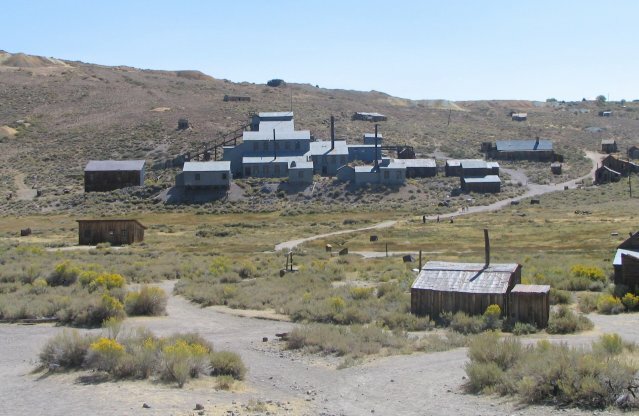 The Bodie Page has been updated with links to the photo galleries of the mining district. 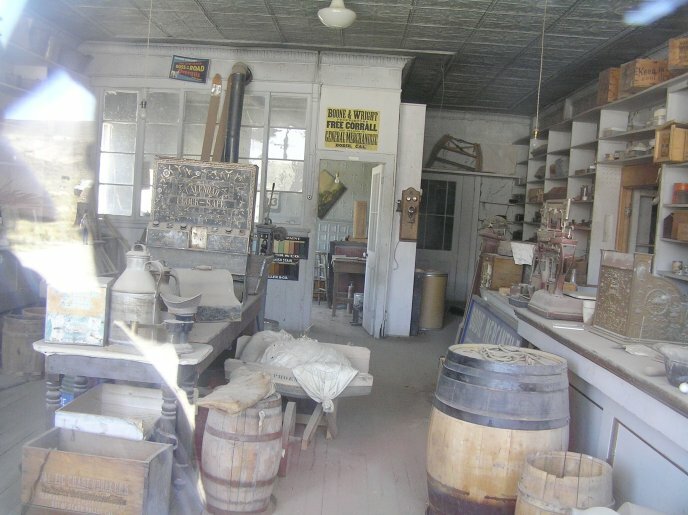 You can see pictures of this particular area of the Bodie ghost town and of the insides of some the buildings. See the inside views photo gallery! See the outside views photo gallery! Demonstrate a wearable electric power system providing 96 hours of equipment operation at less than half the current weight. The power system should attach to a garment (vest) and provide 20W average electric power for 96 hours with peak power requirements of up to 200W for short periods. All components, including the generation, storage, electronics, and connections must weigh 4kg or less, including the attachment system. The total minimum energy required is 1920 W-hr (20W * 96hr). The typical 2 battery RV trailer has an energy capacity of about 2,000 W-hr and, at 33 kg for each battery, weighs nearly 70 kg. The usable energy is only about 1,000 W-hr before recharging is needed to obtain best results. That means the DDR&E is offering a prize to someone who can provide an energy source that weighs about a tenth of the batteries we currently use in our RV and provides perhaps double the energy. During the 96 hours of operation the system must operate: (1) continuously (i.e., 24 hours a day); (2) at partial power; (3) for a number of periods of high power of up to 200W for 5 min; (4) in a non-air breathing mode in a sealed container for a time to be determined; (5) be attitude or vertical orientation and motion independent; (6) provide output voltages of 14V and 28V. The system must attach to a vest and operate while worn. Of course, batteries aren’t the only source of energy. You’ve got those propane tanks on the front of your RV. Let’s see, 1 gallon of propane is 91,600 BTU’s of energy (gasoline has 125,000 per gallon, diesel 138,000, campfire wood 3,500 BTU/lb and household garbage about 2,500/lb). 1,000 W-hr is 3,412 BTU’s. That means that a gallon of fuel averaging about 100,000 BTU is about 30,000 W-hr. At 50% efficiency, that means a gallon would be about 7 times what is needed the DDR&E prize. That is about a half kilogram of fuel so the rest of the machinery could weigh only 3.5 kg. Compare that to your typical genset, like a Honda EU1000i, which weighs 15 kg. This weight does not include the oxygen needed from the air for fuel powered energy, which is probably about on par with the fuel weight. Some of the key points, other than weight and capacity, in the prize offering include they peak power of 200w and the non-air breathing mode. The non-air breathing mode puts severe constraints on a fuel based system. The peak power requirement is also one that will make achieving the prize rather difficult as anyone who has tried to start an air conditioner with a 2kw genset knows. The DDR&E probably isn’t too worried about cost at this point. They also didn’t invent their goals and requirements out of thin air either. They are pushing the envelope with a million dollar prize offer and just maybe some result will trickle down to something an RV enthusiast can afford and use. Doyle is on the edge and in the middle. To the west is the Dixie Mountain Game Refuge. To the north is Honey Lake, Herlong, the Sierra Army Depot, and the Doyle Wildlife Refuge. To the east are the Fort Sage and Virginia Mountains before you find Pyramid Lake. Doyle has been bypassed by a highway, not even a freeway, and exists as a town trapped in time on a bypass loop. At each end are motels in the 50’s style. In the middle is a turn of the (20th) century general store and hotel. A bit off the main drag you can find a bar with braggadocio and perhaps some other indications of a sedate country life in ranching and hunting country. The city green has a gazebo in the grass all set for a nice picnic stop and there was even a porta-potty available if needed. Perhaps the big event in town is the Lizard Race (The Land that California Forgot – good page for a bit of history and background of Doyle). This tends to attract people from all over, such as Kazuya Fujita. The Labor Day Motorcycle Run 2004 page has some more pictures from Doyle. Then there is the Buck Inn short tour. Historical Towns In Lassen County describes some of the other towns (that may no longer exist) in the area. The Lassen County History and Culture – Site Map has links to all sorts of information about the area. 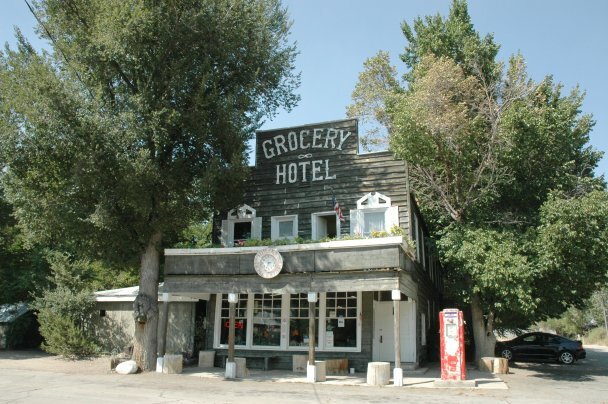 For instance, the listing for the store and hotel which describes the old place and answers some questions that might be important to a buyer. There is an RV park with a dump station out on the main highway. There is also a Shell station and AAA service for the traveler, too. Another Airstream experiment: the Squarestream. Since some folks think the rounded shape of the classic Airstream made for limited space, the company tried to square it up. The modern Airstream is a bit more squared up than the old classics but not like this one. Don’t see many of these on the road – this one is a single owner RV. 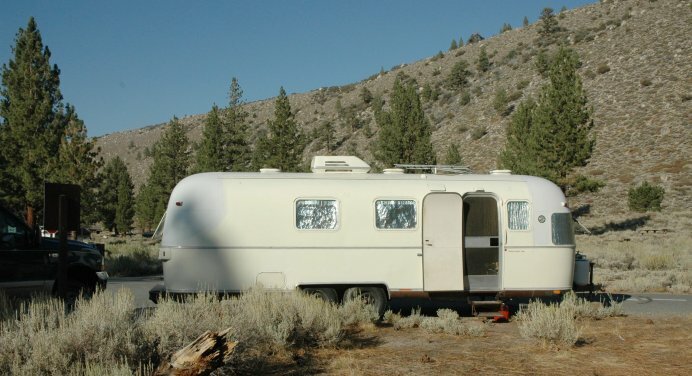 The Argosy was made by Airstream and often tried out new ideas before they showed up in the main Airstream line. Then end caps were steel so they could be formed in one piece – aluminum won’t bend that much. They were also painted, often in colors similar to this one. Like Airstreams, 30+ years just means a bit of maintenance and upkeep for an Argosy to be an RV with all the modern conveniences. Here’s Icyl’s comments: Read the story of the Mulligan’s Argosy (PDF). It was a hazy day because of the fire near Susanville. Here is a photo tour of the Fort Sage OHV trailhead and the scenery of the area. See also the blog entry Fort Sage for links to additional information and pictures. Just north of Doyle off US 395 halfway between Reno and Susanville is Fort Sage. This is a BLM trail head to OHV or off highway vehicle trails. It is a bit off the valley floor and has vistas of Long Creek Valley. There is camping of the ‘dispersed’ style. 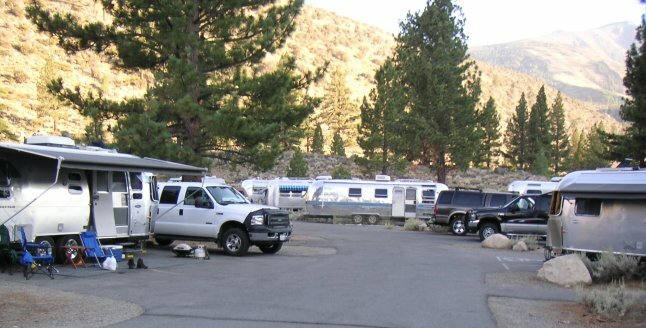 The trailhead has ample parking, fire rings, and a one holer. The elevation is a bit under 5000′ and the few junipers won’t provide much shade. That means wind, dust, and sun are the accompanists to the scenery. Find out more at these links. Bureau of Land Management – Eagle Lake Resource Area – Fort Sage Mountains – the ‘official’ website doesn’t tell you much. California's Least Accessible OHV Area – Fort Sage OHV Area – Dirtbike at Off-Road.com – The Fort Sage OHV Area is located off of Highway 395 north of Reno, Nevada and back across the California border. 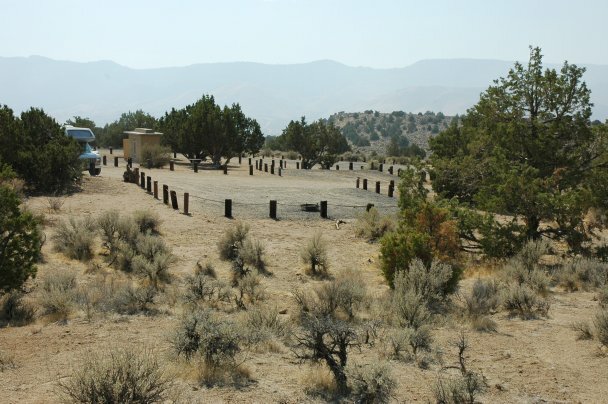 Fort Sage is managed by the BLM with the use of California Department of Parks and Recreation Green Sticker Funds. I have been aware of the existence of the Fort Sage OHV area for some time, but because if its remote location I had not had the opportunity to check it out for myself. Now I know what I have been missing. The California Watershed Portal – Watershed Search Tools – not much water here so there is a lot of interest in what rain goes where. Fort Sage OHV Area | California | Public Lands Information Center | Recreation Search — Information, maps, permits, and guidebooks for planning adventures at western parks, forests, refuges and wildlife areas, historic sites, wilderness areas, lakes and reservoirs, wild rivers, and BLM lands. Info for California. Off-road areas in California — the CA4WDC Sponsored Event – on ORN. Doyle Wildlife Area – the sign near US 395 is weathered and nearly hidden in the brush. It is an adjacent protected area near the BLM lands. NorCal ATV – provides a good summary of the trails. Here is the trailhead from maps.google. The little white square in the middle of the loop is the privy and the one to the upper right is the kiosk with maps and rules poster. Note that there are private lands in the area. In September, a ranch on Ft Sage road near the trailhead turnoff had a ‘For Sale’ sign out by the road. Anyone visiting the area needs to take care to respect others’ property and to make sure they know and follow the BLM rules and regulations for the site. UPDATE: BLM link found by Anita. Let’s hope the BLM keeps this one live for a while! The Consurmerist reports that “ForbesAutos interviewed Wayne Gerdes, a “hypermiler” who can squeeze 84 miles per gallon out of a regular Ford Ranger pickup truck, or 180.1 mpg from a hybrid electric Honda Insight.” The list of ten tips includes most of the usual tips for reducing fuel use (note, this is not necessarily fuel efficiency) with a few oddball items and one or two interesting tips that can provide a bit of insight. For instance, many of us use the cruise control in our vehicles to maintain speed while traveling. The Gerdes tip suggests that “Rather than trying to maintain a constant speed, focus on maintaining a constant engine load.” This becomes important when you in country like we have in the Great Basin where the roads often go up and down minor and major grades. Cruise control strives to maintain constant speed and this is not an optimum for fuel use unless the road is flat and there are no changes such as gusty headwinds to deal with. If you drive with the cruise control off, you can help maintain constant engine load by taking a run a hills and coasting a bit on the last bit over the top. The top tip is to “Inflate tires to maximum pressure.” This is to reduce the energy needed to flex the tires which also means the tires run cooler which tends to reduce odds of tire failure. The key lesson is that it is your driving habits that influence your fuel costs. You are not likely to make much of difference no matter what you do but a few percent can make a bit of a difference and sometimes improve safety as well. The SNU rally on September 20 to 23 will be at Lahonton Beach 7. After a drive out to Berlin last weekend it was determined that the campground is not adequate for the needs of an SNU rally. Short parking pads, close in bushes and problems with the access roads make the campground difficult for anything over a 20ft rig. There is no optional camping area at Berlin or in any area close by so it was determined that it was best to change the rally to Lahonton. The SNU will also have to consider another option for the October rally as problems have cropped up with Ft Churchill. This will be discussed at the September rally. Remember – SNU rally Thursday September 20 to Sunday September 23 at Lahonton Beach 7. See you There. See also Previous entries from weblog search about the road to Berlin for more on this. One of those “oh, does that make me feel old” things is seat belts. If you were a kid in the fifties or sixties, you just perched on the seat. On a long drive you might have enough of a bench seat to stretch out as if on a couch and take a nap. With brothers and sisters, you may have had some contests (i.e. fights) about getting room for a nap on the seat. Modern vehicles have seat belts. Bench seats often have bumps for individual seating comfort that make them uncomfortable beds. Laws and enforcement are pushing harder and harder on enforcing seatbelt use. If you run a motor home that has beds in the RV the odds are you are, or soon will be, getting instruction to not use them when traveling. There is little doubt that using seat belts in a moving vehicle is a good thing. The biggest problem with them is improper use. That is why there is so much attention to child seats. Standard seats are designed for adults and if you are not within the nominal adult size parameters, the seat belts may not fit you properly or you might not have them adjusted for the seating position. This is what prompted Emily Bazelon to write about the Death Nap: The dangers of tilting back the front seat—don’t do it! based on her experience in a crash. I’d reclined my seat, and my seat belt, which was riding high, left a long welt around my rib cage and along my stomach. As it turned out, I had internal bleeding from a lacerated spleen and three cracked ribs. I spent the next two days in intensive care. So, if the government and the automakers won’t tell you, I will. Don’t tilt the front seat back! No matter how much more comfortable your nap will be, you don’t want to end up, like I did, in intensive care. First there were no seat belts, then optional belts, then mandatory use, then warning beeps in cars if the belts weren’t fastened, and now many cars have belts that are automatic when you close the door. All of this has resulted in pushback by those that resent being told what to do. What you can do is to make sure that all in your vehicle are using seat belts properly. If you need to take a nap, find a rest area and take a safe one. If a passenger is drowsy, sit up with good seat belt position and use a pillow if the seat headrest isn’t suitable for a nap. The Berlin-Ichthyosaur State Park was first established in 1957. The campground appears to have been designed for tent campers. The spaces are well apart from each other but don’t have parking for much more than a car. 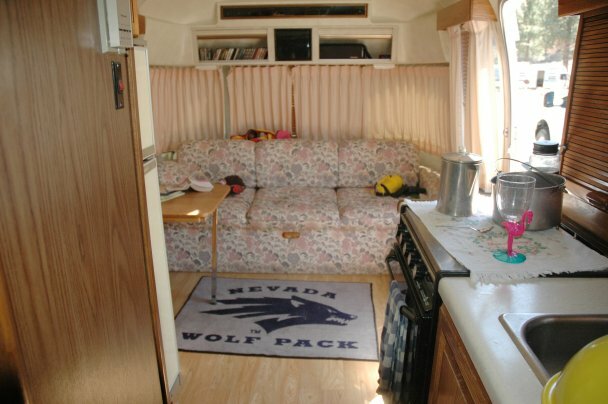 Jerry reports that the brush is in close enough that most modern RV’s would probably get Nevada pinstriping – that is, scratch marks along the side as sharp twigs rub the side of the vehicle. 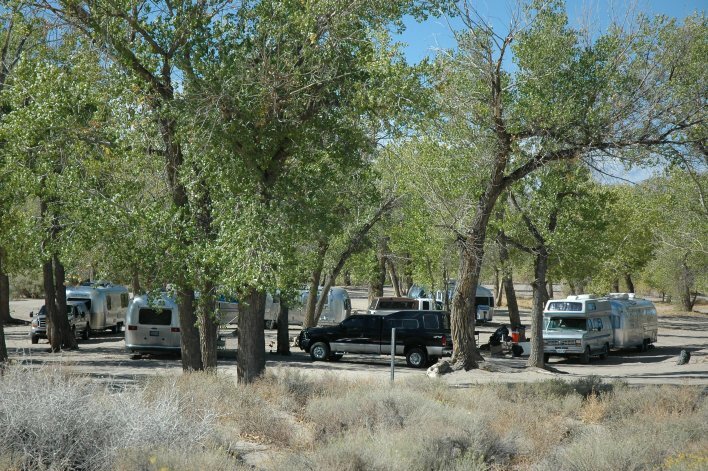 This being the case and there only being 14 defined campsites and only a few of those suitable for “RVs to 25 ft” in the Park’s judgment and the overflow group area not being suitable for RVs either, this state park may not be a good choice for a gathering of more than two or three RVs of moderate length. The state park is in the middle of BLM and NFS land. 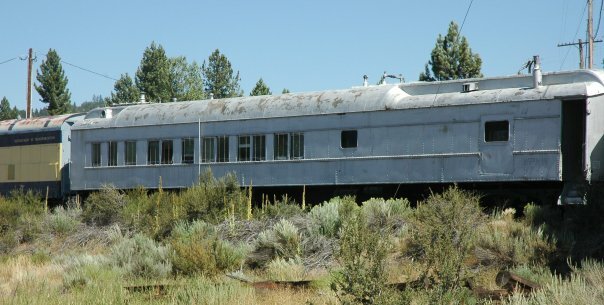 (see Humboldt-Toiyabe National Forest and Nevada BLM Home). There do not appear to be any defined campgrounds near the park so you’d have to find a dispersed camping spot to suit your preferences if the park wasn’t quite it. see also: Previous entries from weblog search. 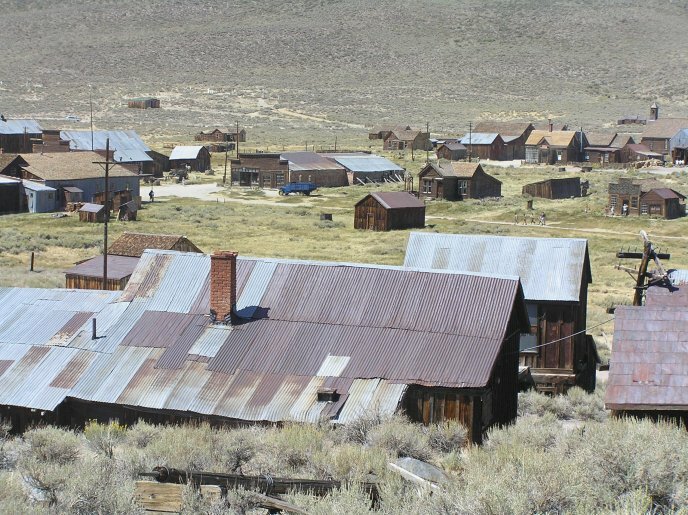 Take a virtual visit of the Bodie, California ghost town with Dave, Don, Roman, and Gene. There are two galleries of photographs taken this August. – See the photo gallery! 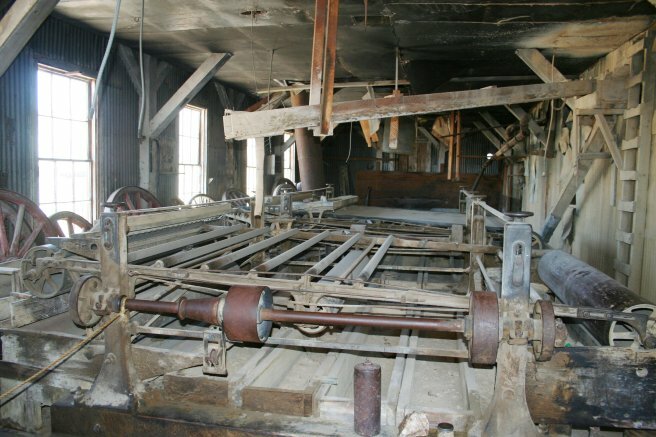 If that isn’t enough, check out the Bodie Destinations page for links to more! 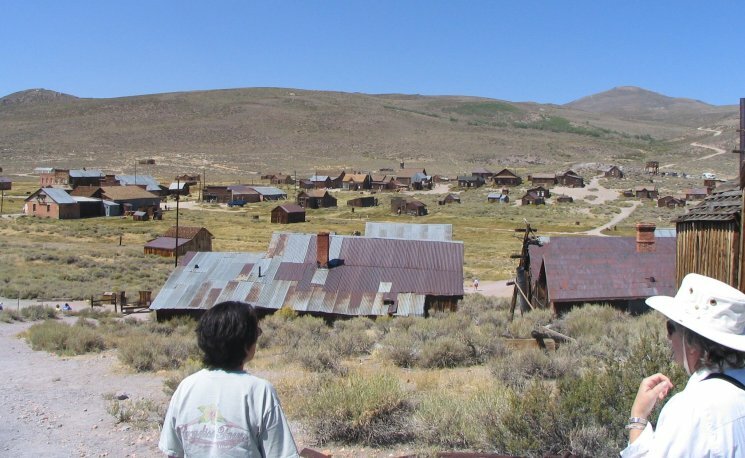 Once again, Chuck Fell took SNU members on a special tour of Bodie, one of the best preserved ghost towns. Bodie is not far from Twin Lakes where the SNU was camped for the weekend. Pictures in this photo gallery were taken by Dave Strode, Don Williams, Roman Kreminski, and Gene Baleme. To the north is US 50 paralleled by route 722, the old US 50, from Eastgate to Austin. The road to Berlin leaves those paved routes and goes over the Desatoya Mountains from Eastgate or up Smith Creek Valley from Paterson Station. To the west is US 95 with route 361 running parallel through Gabbs up to US 50. From there you have to go over the Paradise Range on route 844. On the south is US 6 and US 95 going through Tohopah. From Mina on US 95 you leave pavement to go over the Pilot Mountains, through the Monte Cristo Valley and then over the Cedar Mountains to get to Ione Valley. From Tohopah, leave pavement on the Powerline road to head up Smokey Valley to Ione Valley squeezing between the mountain ranges. To the east, the nearest paved route is 376 down the Big Smokey Valley. To get from there to Berlin, you would go over the Toyabe Range to the Reese River Valley and then over the Shoshone Mountains. That trek would be just north of the Arc Dome Wilderness area. This is not a route to be taken on a whim with any ol’ RV. Once you leave pavement, it is easy to get lost. The main routes are usually easy to see because they are (usually) wide and well maintained. They are also numbered. That is not always definitive, though. There are a lot of unpaved roads through the valleys and going up canyons that might distract you from your destination if you do not have a good idea of where you are going. Getting lost in this country is not something to dismiss lightly. Be prepared. The most common approach to the Berlin-Ichthyosaur State Park is via route 844 from Gabbs, which is paved most of the way. Next most common is the route down from old US 50. The other possibilities, which seem rarely used, are the route over from the Reese river valley or from the south via Powerline road and Ione road. The intersection of 361 and 844 north of Gabbs is at about 4600′ elevation. The mouth of Menter Canyon is about 6 miles from the intersection at 5800′. From google earth data, the road through the canyon is about 1.6 miles and rises 1000′ – that appears to be an average of a near 12% grade! The reports of those who travel the grade seem to indicate that the actual grade is more reasonable at maybe 6% to 8%. Once you get up that grade through Menter canyon, the going isn’t too bad as it goes over the Paradise Range in elevations from 6500′ to 7000′ feet until it gets down to the 6200′ elevation of Ione Valley. There is only a mile or two of gravel on the approach to the park. From EastGate, Buffalo Creek Road leaves route 722 at a 5400′ elevation to the summit at 7100′. Along this route you climb about 1000′ in more than three miles. That’s a 5% grade. Most of the rest of this route seems to run up and down about 100′ per mile which is about a 2% grade. One motorhome tourist that took this grade says he was able to do most of it at 30 to 40 mph. It seems it is a rather gentle gravel road without much in terms of either grade or washboard or ruts. The alternative from the south of Austin is route 472 out of Paterson Station. It skirts the foothills of the Shoshone Mountains. Except for 844 from Gabbs, these roads are miles of unpaved travel. That means dust and rocks that can ding siding or break light lenses. You have many options for ways to get to Berlin-Ichthyosaur State Park and all of them are for the adventurous. See the Previous entry: The Road to Berlin: the challenge for more information and links to other resources. Onan is a popular manufacturer of gensets – generator and motor sets – for the RV industry. The 2.8 kilowatt Microlite in a 1991 Airstream B-Van suffered as many of them do. It had only run a bit over 100 hours in 16 years and had been otherwise neglected. Varnish from drying gasoline had built up in the carburetor, linkages had broken or become stiff, and things had become a bit dirty. It was hard to start and didn’t quite run right when it did run. So the time had come to clean, adjust, repair, and fix it up. This kind of thing is a ‘do it yourself’ thing because the time requirements in a shop tend to create a bill that is close to the cost of a new genset. 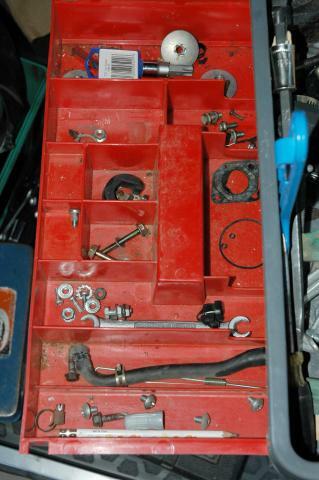 To do it yourself, you will need some expertise, a few common tools, an Onan service manual for the genset, and a few of the appropriate personal attributes that lead towards a successful outcome such as patience, intelligence, good study habits, mechanical aptitude, experience, knowledgeable friends, resources, and more. This is part one of the story of one such back yard effort. It is not a how-to but rather a caution for you to see what is involved and what someone else did. You should not attempt this sort of project unless you understand the risks involved, both financially as well as in terms of safety, and have competence in good decision making. This is the first of entries planned to describe how this effort proceeds. There will an attempt to explain what the various components do and how they work. The hope is to help you better understand some of the systems that make your RV experience more enjoyable. The first job is to get the genset out of its nest. 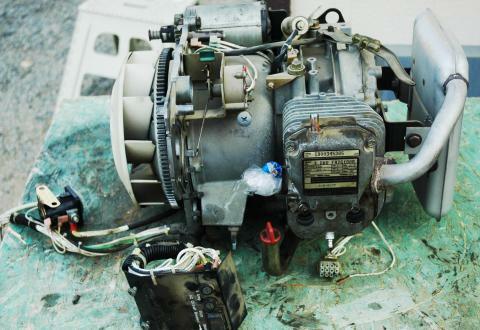 That is a matter of removing two screws on flanges holding the genset down, removing the exhaust pipe from underneath, and then disconnecting the battery and ground terminals. Inside the B-Van, the power feeds from the genset to the transfer switch needed to be disconnected so the wires could be pulled. Then the genset could be pulled out a bit and the fuel line and power cables could be disconnected. Once everything is free, the genset could be removed from its nest. The genset is heavy and awkward so take due precautions to protect yourself and your equipment when moving it. After the cover and the shrouds to control airflow and the carburetor have been removed, this is what you get. The fan is on the left and the muffler is on the right. At the top is the starter. You can see a plastic bag stuffed into the hole where the carburetor attaches to the cylinder. That is an attempt to prevent unwanted crud from getting into the cylinder. 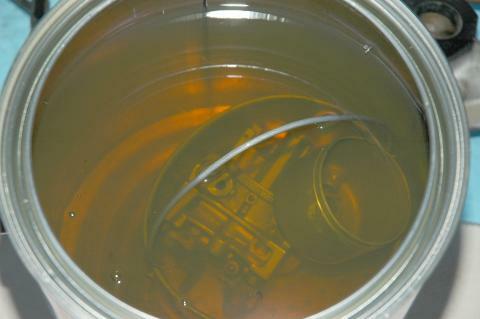 The carburetor was removed so it could soak in a cleaning solution. All rubber O-rings and other non metal parts had to be removed else the cleaning solution would dissolve them. Gasoline varnish is tenacious and difficult to remove. The carburetor has many small holes that get clogged and the varnish must be cleaned out of the for the engine to run properly. 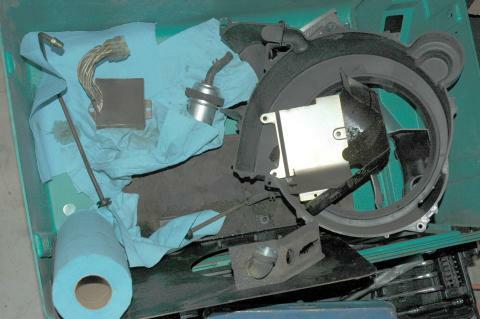 Here are the shrouds and some other parts stashed in the genset cover. They will need to be cleaned. Detergent and water will usually do for these. One of the big challenges is keeping track of the miscellaneous small parts such as fasteners, springs, and other esoterica. A partitioned tray like this one will handle a small job like the genset. Note that you will need to secure the stranded things in the empty nest. If you don’t stopper the fuel line, you will leave a trail of gasoline behind if you try to head down the road (don’t ask how I know!). The battery positive line needs to be protected so you don’t get any shorts. Any loose pieces should be tied down until you get the genset back into its nest and re-attached. Wheel Technical Information is a good resource to use to answer questions you might have about lug nut torque, wheel terminology, determining vehicle fitment, and other esoteric stuff. Twin Lakes Rally photo galleries up! There were a lot of people taking pictures so there are two photo galleries of the SNU Twin Lakes Rally experience. There is an index page for the 2007 rallies you can check to see what other galleries are posted. See the gallery for the first two days of the rally! This rally set a record for the number of rigs in the Crags group area. There were some new rigs to check out and a lot of people to catch up with. See the photos for the last two days of the rally!